Apologies for the blogging absence; I’ve been very busy with work, and also with projects for Adventures With Words and Hear Read This (a new book club podcast), but I wanted to tell you about the fantastic evening I had at the South Bank Centre in London, all the way back in September. The South Bank Centre have some fantastic literary events so I’ve signed up to their mailing list and I was really excited to see that Oliver Jeffers, a fantastic writer and illustrator of picture books, and also a fascinating artist, would be giving a talk about his work, coinciding with an exhibition of his art in London and the release of a new picture book with his illustrations, The Day The Crayons Quit (story in this case by Drew Daywalt – the first time Jeffers has drawn for someone else’s plot). As usual, trains were a nightmare and I thought I was going to be late but, luckily, the South Bank Centre had some technical issues of their own getting Oliver’s MacBook Keynote and his iPad to both show on the screen in the theatre so I actually arrived just in time (phew). Jeffers was a brilliant speaker and it was fascinating to hear about his art work, and the background leading to his decision to create picture books, as well as his creative process. 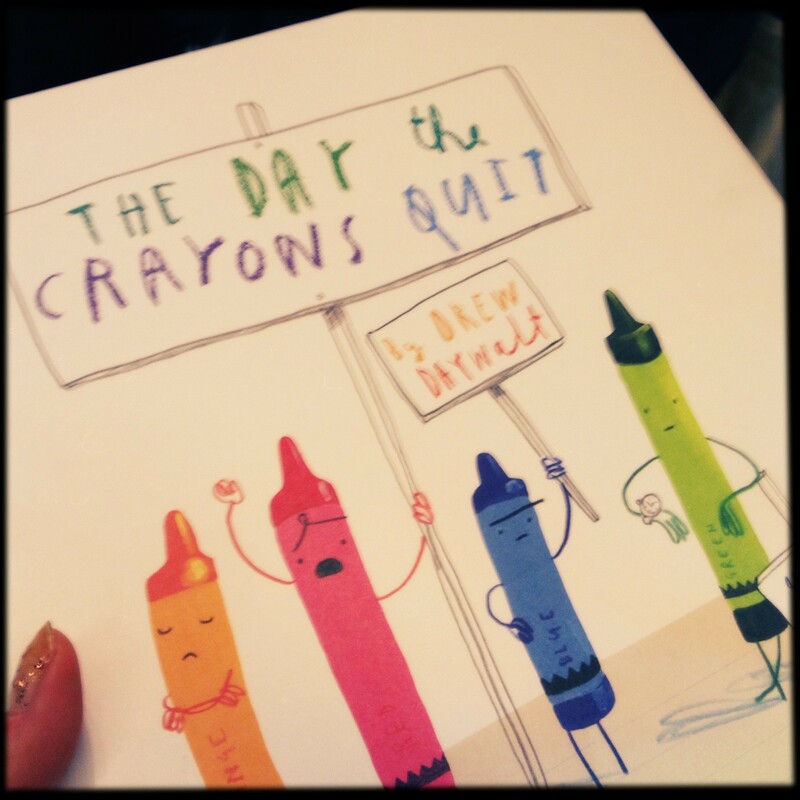 There was just enough time afterwards for me to get my copy of The Day The Crayons Quit by the man himself (he said, “Just remember this is a black and white drawing of an orange crayon!”) and still make my train home. What a great evening!